f you’re at all interested in craft beer, you’ve probably heard of Dogfish Brewing. Distributed to over 30 states Dogfish is one of the top microbreweries in the country, 13th in fact. Founded by Sam Calagione in the mid-90’s, Dogfish has grown steadily and developed a reputation for solid stalwarts such as their 60-minute IPA and a penchant for risk-taking brews relying on unique ingredients and processes. While named after a craggy coastal vacation spot on the coast of Maine, Dogfish’s home sits in the oft-overlooked beach towns of Delaware. Only a few hours from Philadelphia and Baltimore, it feels much farther as pancake flat farm fields abut beach style strips along the DE Coastal Highway. It’s amongst this area Dogfish has made its home. In Milton, DE sits their brewery, distribution center, and headquarters; in Rehoboth Beach their original brewery and brewpub. And last year they expanded to Lewes Beach. 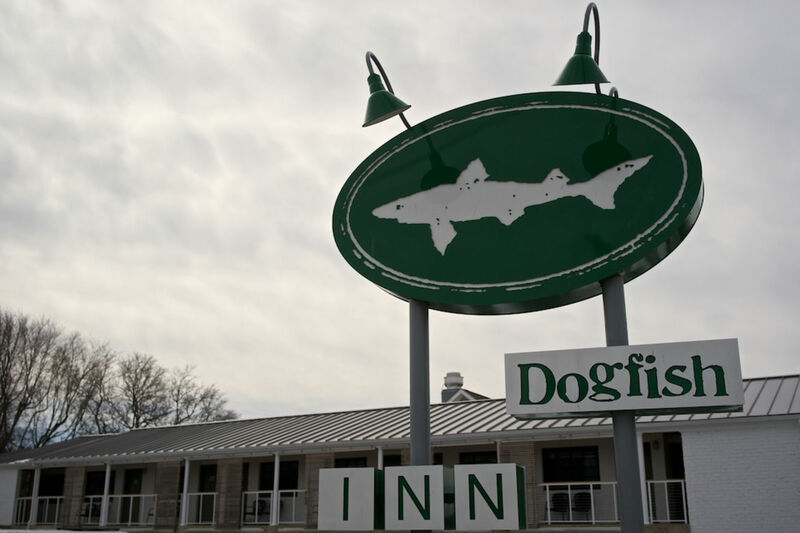 In classic quirky Dogfish style they opened their own inn. Working with Studio Tack from Brooklyn, NY, Dogfish transformed a run down beach motel into a truly awesome place to spend a few nights. The rooms combine light wood floors with ample light, mid-century modern inspired furniture, Tivoli radios, custom Woolwich blankets, and Apolis beach bags to create the studio beach apartment you wish you never had to leave. While the temptation to stay in your room might be strong, venturing out gives a wealth of options. Just at the Inn’s cottage (aka the lobby building), there’s a fire pit area for relaxing and trying some beers with friends new and old, a library stocked by San Francisco’s City Lights Bookstore (a Huckberry favorite), and an indoor fireplace hangout area where Sam Calagione frequently drops by to chat. Leaving the Inn provides even more options with the beach right down the road, hikes to be found, and local haunts. Be sure to use the free bikes they have on site when you do venture out, and pick the brains of the staff for the must see spots. Jon Gaffney is a man of the road who enjoys testing the recommended use limits of everything he owns. When he's not taking photographs, he's climbing, hiking, swimming, or gripping the wheel of his Sprinter Van. You can follow his continuing cross-country adventures as the Huckberry Van Man here.